"It is a relief. It's a confidence builder," Toews said. 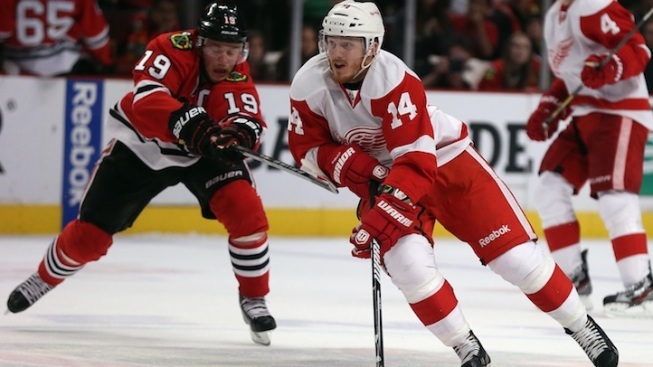 Gustav Nyquist of the Detroit Red Wings moves past Jonathan Toews of the Chicago Blackhawks in Game Five of the Western Conference Semifinals. The power play returned in the second half of the second period. All it took was one brilliant tip by one of the youngest players on the ice and a well-placed shot by the captain of a team in trouble. All that tinkering paid off when the Chicago Blackhawks needed it the most. Jonathan Toews and Andrew Shaw each had a timely power-play goal, and the Blackhawks avoided elimination with a 4-1 victory over the Detroit Red Wings on Saturday night in Game 5 of the second-round playoff series. "I've been saying it over and over the last couple of days: Stay positive and stick with it and things have to turn your away eventually, and they did tonight," Toews said. The 21-year-old Shaw added his third career playoff goal in the third as the Blackhawks stopped the Red Wings' three-game winning streak by creating chaos in front of Jimmy Howard, who had shut down Chicago's attack while moving Detroit to the brink of the Western Conference finals. With the sellout crowd chanting "Ho-ward! Ho-ward!" in an attempt to shake him, the standout goalie made 41 saves in another solid performance. But the Blackhawks created enough quality chances that he simply couldn't stop all of them. "We knew it. We knew we were going to have to weather the storm early against them and I thought we did that," Howard said. "We got it going there, but they just kept coming and coming." Daniel Cleary scored for the second straight game for Detroit, which will have another chance to close out the top-seeded Blackhawks in Game 6 on Monday night. That will be at home, too, where the Red Wings are 4-1 in this postseason. "We weren't good enough tonight as far as our plan we have to play to be successful," Red Wings coach Mike Babcock said. "There was too much space and they were just freewheeling around having fun. It just goes to show you how hard it is to win and you've got to compete and do things right in order to be successful." Detroit trailed 1-0 before Cleary completed a strong rush during a 4-on-4 stretch in the second period, beating Crawford from a tough angle on the left side for his fourth goal of the postseason. Henrik Zetterberg set up the score by throwing the puck across the crease while Brendan Smith was streaking toward the net. Back came Chicago, which responded with two of its best power plays in weeks. The Blackhawks had converted only three of their first 25 chances in the postseason, and coach Joel Quenneville tried all sorts of combinations in practice to no avail. He finally got what he wanted in Game 5. First, Shaw had a perfect tip on Duncan Keith's slap shot to make it 2-1 at 13:08. Then Justin Abdelkader received his second penalty, this one for cross checking, and Toews wristed a shot off Howard's facemask and into the upper right corner. "Good things come from shooting the puck," Shaw said. "There's rebounds, there's loose pucks, and we had all guys converging to the net and we just kept picking them up and hemmed them in there and tired them out and we were rewarded." It was Toews' first playoff goal since April 21, 2012, at Phoenix, snapping a scoreless postseason drought of 10 games. It also came after he appeared frustrated while committing three penalties in the second period of Game 4. The captain was mobbed by his teammates after he skated to the boards, and the crowd of 22,014 roared its approval. "It is a relief. It's a confidence builder," Toews said. "You know the way you're working is adding up to something. You want to keep that going now. If I keep shooting the puck there's a good chance it's going in. The goaltender has to make a stop." Chicago got off to a good start with a 4-1 victory in Game 1 of the series, but it had been all Detroit since that opening win. The Red Wings turned up the pressure on defense and Howard had an amazing 86 stops on 88 shots over three straight wins that pushed the Blackhawks to the edge of an early postseason exit. Back at home after managing just one goal in a pair of losses in Detroit, the Blackhawks came out with a spirited opening period. Brent Seabrook, who played only 12 minutes in Game 4, and Bickell each delivered a huge hit in the opening minutes. Bickell then plowed ahead to set up Chicago's first goal since the third period of Game 3. Howard turned away Bickell's first charge, but he skated around to the other side of the net and was right there to slam home on the rebound when Patrick Kane was denied. Bickell pumped both his arms after he gave the Blackhawks their first lead in a week. It was the fourth goal of the season for physical forward, but his first since Game 4 of the first-round series against Minnesota. The Red Wings then rushed down the ice, and Crawford turned away quality opportunities for Joakim Andersson and Gustav Nyquist. Crawford made 11 saves in the opening period. "It's hard to match that when their backs were against the wall," Cleary said. "But we have to be ready to go like our backs are against the wall on Monday." NOTES: Chicago Blackhawks Charities donated their portion of the Split the Pot money from Game 5 to the OK Strong Disaster Relief Fund to benefit the victims of the deadly tornadoes in Oklahoma.